Planting grass seed in an existing lawn improves thinly growing grass and prevents warm-season lawns from turning brown over winter. 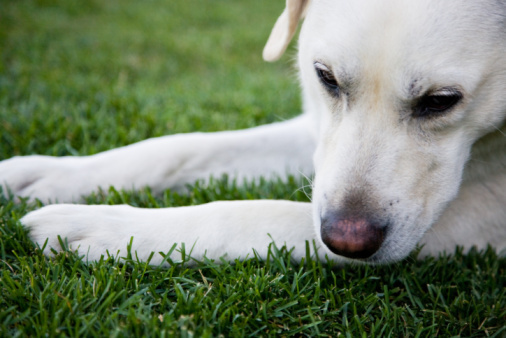 Also called overseeding, sowing grass seed in lawns is part of general lawn renovation, including controlling weeds, improving soil condition and supplying fertilizer. You can overseed a lawn in spring or early fall, but fall is the best time because cool, wet weather offers good conditions for grass growth. If overseeding a warm-season lawn with cool-season grasses for a green winter lawn, you must overseed in fall. 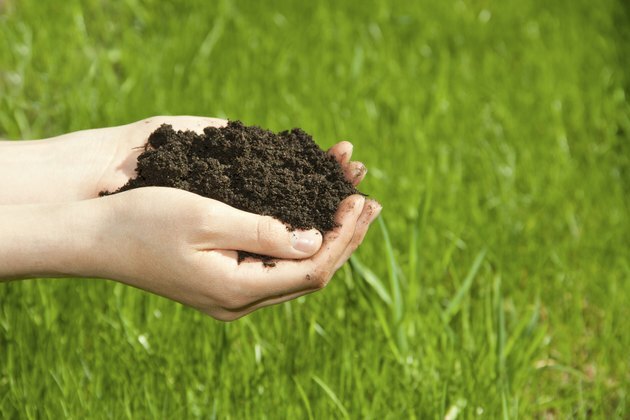 Local college horticulture departments usually provide soil tests that show what fertilizers to apply when overseeding your lawn. Handful of grass seed being poured over grass. Dandelion weeds on grass field, in front of a lawnmower. 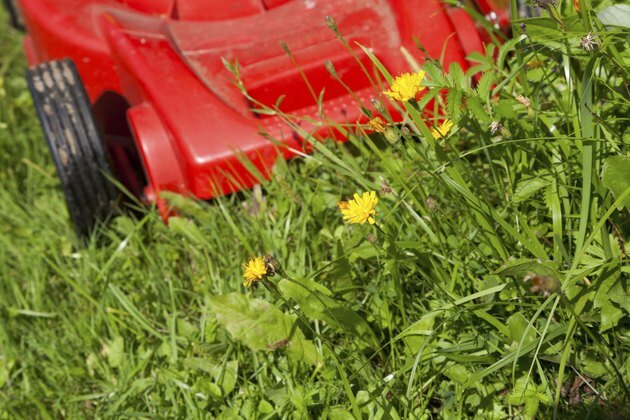 Weeds compete with grass for water, nutrients and light, and should be removed before overseeding an existing lawn. You can remove small weeds by hand-pulling them or digging them up with a hand-weeding tool. Large, deep-rooted weeds can be pulled with a specialized tool called a weed popper. If your lawn is heavily infested with weeds, consider applying a lawn herbicide five to seven days before sowing grass seed. If you apply herbicides before overseeding your lawn, allow it to grow slightly longer than normal first. This lets broadleaf weeds produce larger leaves at the top, providing more area to catch herbicide when it's applied. Select a herbicide according to the type of weeds and turf grass. A product containing 0.1 percent quinclorac, 0.22 percent MCPP-p, 0.12 percent 2,4-D and 0.05 percent dicamba controls broad-leaved weeds on most lawn grasses. On a dry, still day when temperatures are above 45 degrees Fahrenheit and below 90 degrees Fahrenheit, put on protective clothing, such as long pants, a long-sleeved shirt, safety goggles and gloves, and lightly spray the product over the center of each weed. Manufacturers' instructions vary, so always apply herbicides according to the advice on the label. Man mowing large grass lawn. Mowing, dethatching and aerating are essential steps to preparing a lawn for overseeding. 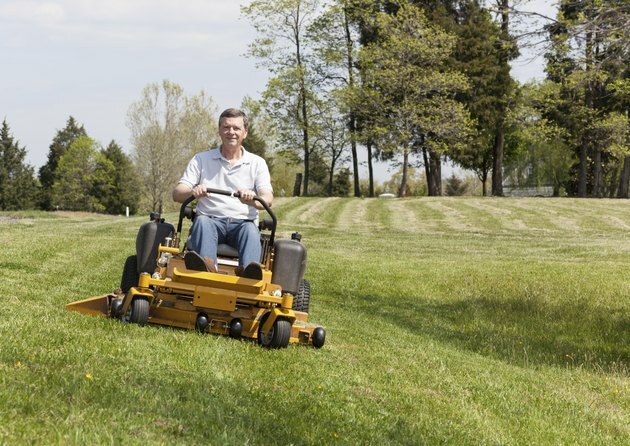 Just before overseeding, but after a herbicide application, you should mow the lawn at the lowest setting on your lawn mower, so that the blades cut just above the soil, and rake up the grass clippings. Check the lawn for thatch, which is a layer of moss, dried lawn clipping and plant debris. If the thatch layer is thicker than 1/3 inch, do a hard raking or run a dethatcher over the lawn. Remove about 50 percent of the thatch from all over the lawn, leaving the rest to act as a mulch. Using a dethatcher helps cultivate the soil and prepare a seed bed for the establishment of lawn grasses. Aerate the soil with a lawn aerator to remove plugs of soil and help break up compaction so that air and water can penetrate to roots. Hand sewing grass seeds in dirt. The correct rate for sowing grass seed depends on the grass variety. For example, annual ryegrass (Lolium multiflorum) is a cool-season grass for providing winter color in warm-season lawns, and is sown at a rate of 7 to 9 pounds per 1,000 square feet. Perennial ryegrass (Lolium perenne, USDA zones 7 through 10) is a tough grass for high-traffic areas, and is sown at a rate of 6 to 8 pounds per 1,000 square feet. Both of these grasses have invasive tendencies. 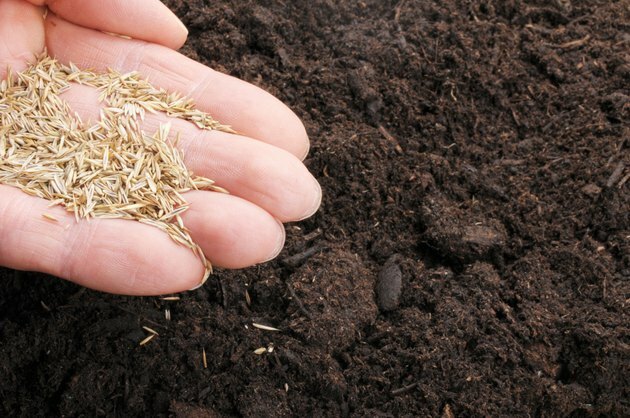 In wet weather and with good aftercare, 95 percent of grass seeds should sprout and grow well. In dry weather, on thin, dry soil and other poor conditions, sow at the higher rate. Sow grass seed using a handheld, drop or broadcast spreader. Divide the seed into two portions and make two passes over the lawn, one up and down and the other from side to side, to ensure even coverage. Sow grass seed two to three times more thickly on bare patches. Handful of fertilizer over grass lawn. Grass seed needs fertilizer and regular irrigation to grow well. Before planting, apply lawn fertilizers according to the recommendations on a soil test report, or if no report is available, apply 2 pounds of potassium, 2 pounds of phosphorus and 1 pound of nitrogen per 1,000 square feet. Lightly rake the lawn to a depth of 1/4 inch to work the fertilizer into the soil and to cover the grass seed. Roll a lawn roller over bare areas of the lawn with no grass to ensure good seed-to-soil contact, and water the lawn with a soft spray attachment on a garden hose until the soil is moist to a depth of 4 inches. Water the lawn when the soil surface is dry so that the soil stays moist but is never saturated. When the grass seedlings are about 2 inches tall, apply 1/2 to 1 pound of nitrogen per 1,000 square feet.